"Cyber Dragon" + "Cyber Dragon"
This monster appears in the artwork of Cyber Network. This card's DEF is equal to the ATK of Cyber Dragon. Also, the DEF of Cyber End Dragon is equal to this card's ATK. Cyber Ogre 2 follows this pattern by having its DEF match the ATK of Cyber Ogre as well its own ATK being 700 points higher than that (much like this card's ATK). This is the only one of the Cyber Dragons that does not have an alternate artwork, that had it recolored black to fit Zane Truesdale's new personality, because it was not copied by Cyber Shadow Gardna during Zane's Duel against Chancellor Sheppard. The head on the left bears similarities to Cyber Dragon Zwei. This card has a Thunder-Type counterpart, Twin-Headed Thunder Dragon, with whom it shares the same ATK, DEF and Attribute. When Fusion Summoning "Cyber Twin Dragon", you cannot apply the effect of "King of the Swamp". You can use the effect of a card like "Metamorphosis", "Cyber-Stein" or "Summoner of Illusions" to Special Summon a monster with the text "A Fusion Summon of this card can only be done with the above Fusion Material Monsters. ", such as "Cyber End Dragon" or "Cyber Twin Dragon". 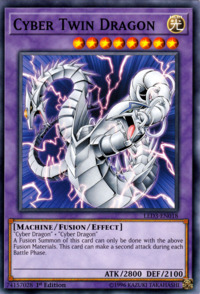 : Can you use the effect of a card like "Cyber-Stein" to Special Summon "Cyber End Dragon"? If "Proto-Cyber Dragon" is face-up on the field and has its name treated as "Cyber Dragon", then you can use it as a Fusion Material for "Cyber Twin Dragon" or "Cyber End Dragon". : Can you use "Proto-Cyber Dragon" as a Fusion Material for "Cyber End Dragon"? The "This card can make a second attack during each Battle Phase." effect is a Continuous Effect. Confusion Chaff: If the second direct attack is declared by the same monster that performed the first direct attack, then you cannot activate "Confusion Chaff". : When the same monster declares two direct attacks, can you activate "Confusion Chaff"? For example, when "Mataza the Zapper" or "Cyber Twin Dragon" perform two direct attacks, you cannot activate "Confusion Chaff". You can Special Summon "Cyber Twin Dragon" with "Cyber-Stein" or "Metamorphosis". Honest: If you use "Honest's" effect to increase the attack of "Cyber Twin Dragon", the ATK increase does not change when you battle a different monster.